How Long Does a Firm Remain on Our Ranking? Do Firms Pay for Their Ranking? Do Firms Have a Say in Their Ranking? Can Firms Request to be Removed? Can anyone submit a request to AdvisoryHQ for us to consider adding a firm to our “Top Ranking” publications? 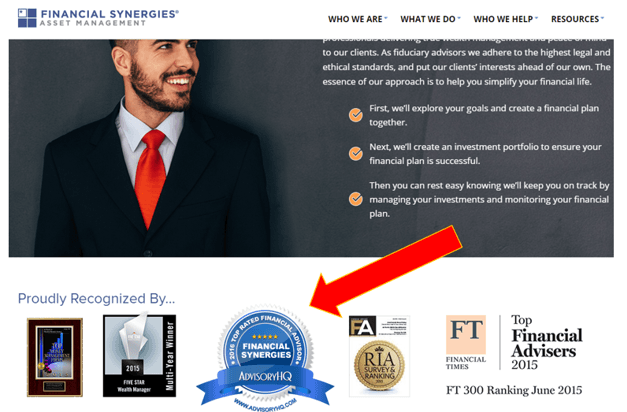 Yes, we often receive emails from firms and professionals requesting AdvisoryHQ to consider their firms for inclusion into our ranking publications. Unlike other publishers that require extensive forms to be completed in order to be considered, AdvisoryHQ utilizes highly advanced methodologies and defined processes for identifying, screening, selecting, and ranking companies. In addition, our breakthrough Top-Down Company Selection Methodologies are carried out by actual people (our editorial, research, and due diligence team) versus by online systems or machines. Our ranking articles are always 100% independently researched and written. In fact, most firms do not even realize that they are being considered and reviewed by AdvisoryHQ until after our ranking publication has been completed and published to the public. 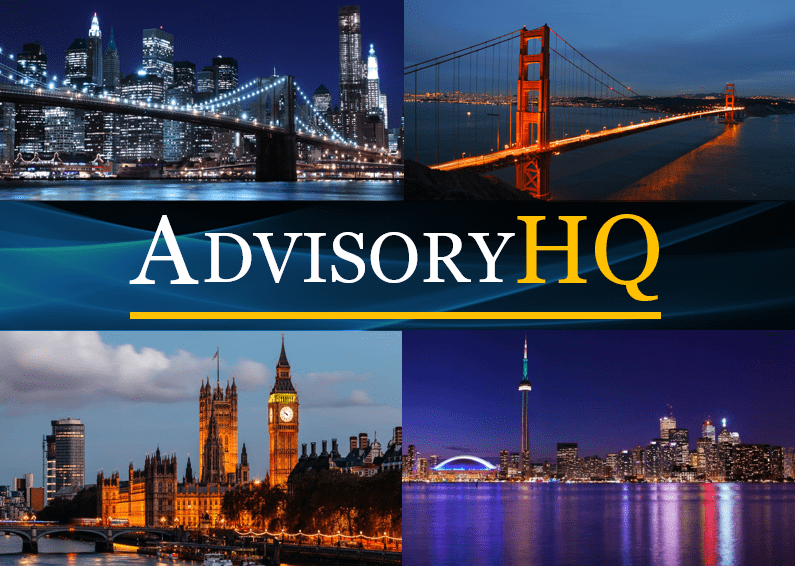 AdvisoryHQ is currently in the process or reviewing firms for our 2019 rankings. See our editorial calendar for when we’ll be ranking firms in your city/state/country. First, review our selection methodologies to ensure that the firm meets our selection criteria. 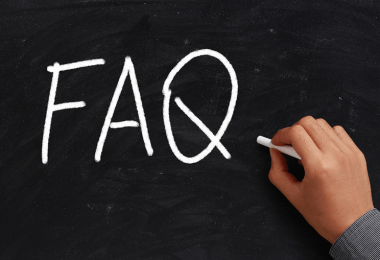 In your email, please list the various reasons you feel the firm should be considered by AdvisoryHQ. You can also click on the “Request a S.W.O.T Review of Any Company” button below for information on our review services for finance related organizations (wealth management firms, financial advisors, small-mid sized banking firms, accounting firms, and mid-sized consultancies). Requesting this report for your firm allows you to identify external weaknesses that you might not even realize are impacting your organization. It also includes an objective comparison analysis of how your company compares to its nearest competitors. Note that competitors can also request a PRIVATE S.W.O.T Investigative Review of your organization for strategic competitive planning reasons. Below are the timeline dates for when AdvisoryHQ will begin collecting information, conducting research, performing due diligence, and publishing its 2019 rankings of best companies in various industries. Please note that these dates will change slightly based on various factors. As such, kindly bookmark this page and check back often to get the latest timeline dates. Selected firms that make it into AdvisoryHQ’s top ranking lists are reviewed and ranked relative to other firms in the same location, industry or sector, and they remain on our list for 1 year. 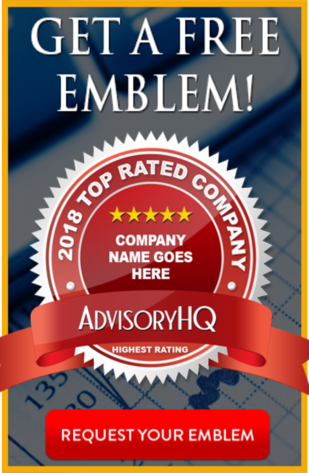 Best Financial Advisors in the U.K.
Best Robo-Advisors in the U.K.
AdvisoryHQ grants firms the permission to use the award emblem associated with their firm’s review and ranking for free. We do not charge for the use of our award emblems. We only ask that you give credit to AdvisoryHQ News (the publisher) by linking back to the article page in which your firm has been reviewed/ranked. From sharing with clients/consumers to including it on corporate marketing materials, an award emblem is a great way to trumpet your firm’s recognition. 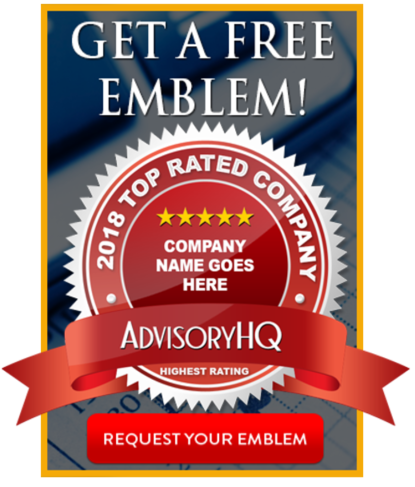 If your firm has been reviewed or ranked by AdvisoryHQ, click on the “Request Your Free Award Emblem” button below to request your free award emblem. (2) You can promote the recognition using a blog post. 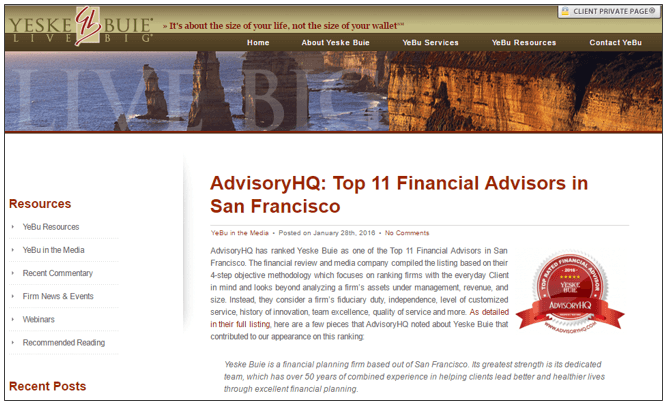 Yeske Buie was named one of the Top 11 Financial Advisors in San Francisco by AdvisoryHQ! 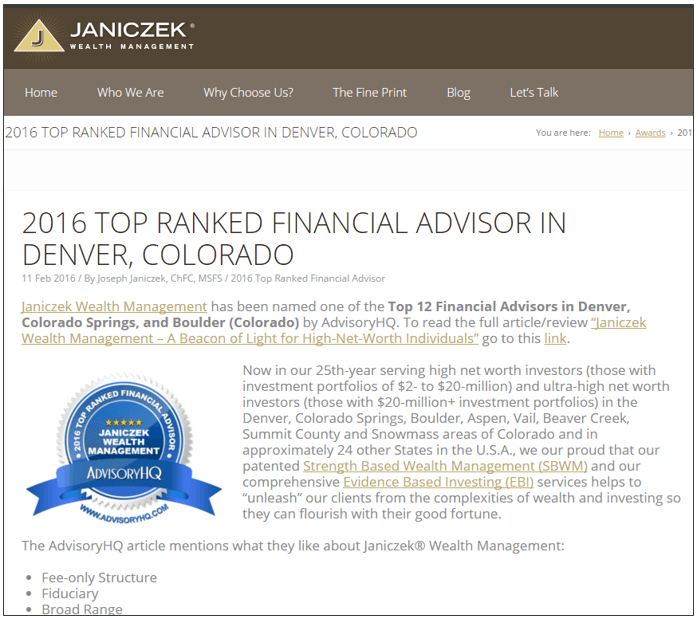 Janiczek Wealth Management has been named one of the Top 12 Financial Advisors in Denver, Colorado, by AdvisoryHQ. (3) You can promote your award emblems via social media. 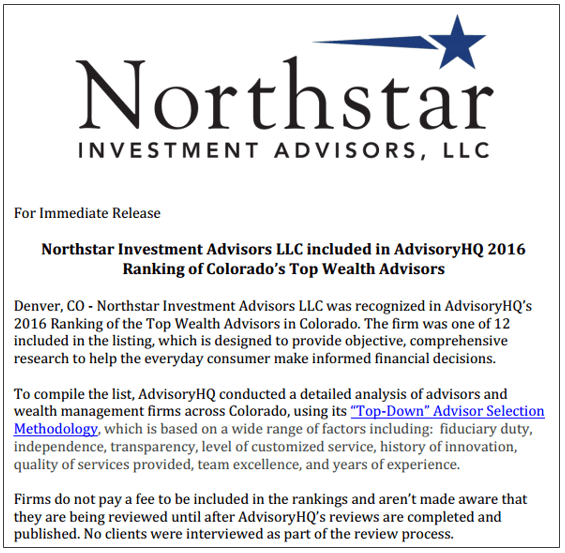 Northstar Investment Advisors: 2016 Ranking of Colorado’s Top Wealth Advisors. D.B. 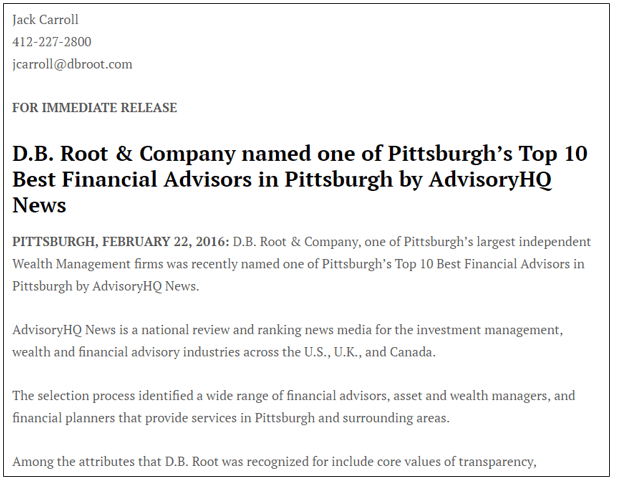 Root & Company was named one of Pittsburgh’s Top 10 Best Financial Advisors by AdvisoryHQ News. Click below to request your free award emblem. Can firms request corrections to their reviews or rankings? Yes, firms that have been reviewed and ranked by AdvisoryHQ can and sometimes do send us requests for corrections to be made to their reviews. Please note that we do not consider “addition requests” (for example, asking us to add content to your review). An example of an acceptable correction request is a request to change/update incorrect information that AdvisoryHQ has included on your firm’s review/ranking. All requests should be sent to our editorial support team (see email below). Note: AdvisoryHQ’s support and editorial team receive a large number of emails, calls, and voicemails each week, so the best and quickest way to let us know about a correction or update is to follow the below process. Just point out the incorrect data/figures on your message. Copy the “review content” that we published about your firm onto a MS Word document (include your firm’s name). Make the necessary changes/corrections using track changes. Please only focus on the section that we posted about your firm. Please do not copy and paste the whole “top ranking” article! Follow up with us in 48-72 hours if you don’t get a response to your initial email. Upon receiving your updates, our review team will conduct an objectivity review and make the necessary updates to the live publication. The U.S. Securities and Exchange Commission requires registered investment managers to disclose the criteria for any awards and recognition they have received. If your registered investment firm has been rated by AdvisoryHQ News, you can use the verbiage below highlighted with green font color. However, you don’t have to be a registered investment advisor to use the verbiage that we have provided below. Anyone can use the below verbiage on a press release, on their social media page, or on any promotional platform when promoting the award and recognition received from AdvisoryHQ. 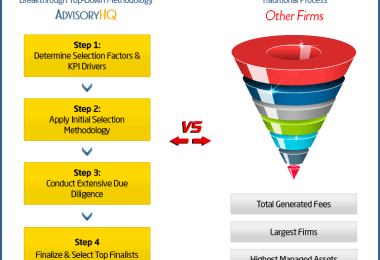 AdvisoryHQ uses a multi-step selection methodology for identifying, researching, and generating its list of top ranked firms. AdvisoryHQ’s review and ranking articles are always 100% independently researched and objectively written. Firms do not pay for their ranking. In fact, most firms do not even realize that they are being reviewed and ranked by AdvisoryHQ until after their reviews have been completed and published to the public. Below is a step-by-step overview of AdvisoryHQ’s methodology process. Step 1: Using publicly available sources, AdvisoryHQ identifies a wide range of firms that are providing services in a designated area (city, state, or local geographic location). Step 2: AdvisoryHQ’s review team then applies initial methodology filters to narrow down the list of identified firms/products. These filters include company strengths, trustworthiness, transparency, professional reputation, managed asset, ROI/ROA effectiveness, fees structure, what customers/clients are saying about the organization, and many more. Step 3: After trimming down the initial list, AdvisoryHQ then conducts a deep-dive assessment of the remaining firms. The award criteria takes into account a range of factors, including experience level, level of customization, site quality, resources, features, range of provided services, innovation, value-added, and many more factors, to build up a broad picture of what each firm or product has to offer, before the final selection process occurs. 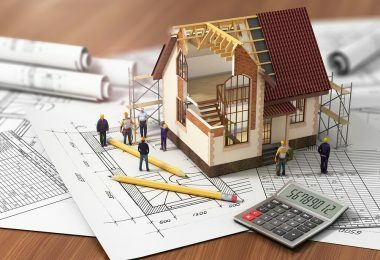 Step 4: Based on the results of the performed assessment, AdvisoryHQ’s research and selection team then finalizes the list of entities that make it into its top rated publications, which are then published to the general public. How Long Does a Firm Remain on Our Ranking List? Selected firms remain on our list for one year until the next year when we perform our annual review, at which time each firm is reviewed and re-ranked or de-ranked in comparison with other firms/products. AdvisoryHQ continually updates its methodology filters to ensure we are meeting the needs of our consumer audience. As such, a firm or product that is ranked as a top firm/product this year may not make the list next year. Note: Our focus is on the everyday consumer. All our research, ranking, and review publications are drafted from the viewpoint of the consumer. We’re dedicated to comprehensiveness, transparency, objectivity, and clarity in how we work. Firms do not pay for their ranking. Our ranking articles are always 100% independently researched and written. In fact, most firms do not even realize that they are being considered by AdvisoryHQ until after our ranking publication has been completed and published to the public. However, firms can request that we review their company and services. This is separate from our ranking program. 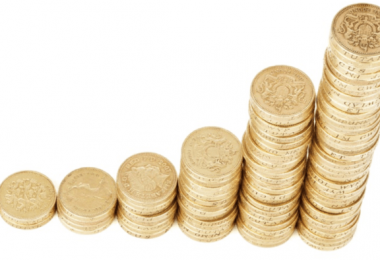 Firms do pay to have AdvisoryHQ conduct an objective review of their companies. Click here to read more about our “Request a Review” service. Note that a review does not warrant that a firm will be included in any of our ranking publications. In order to be included in any AdvisoryHQ ranking list, firms have to pass our rigorous selection methodologies. Also, after we’ve published our top ranking publications to the general public, firms can request to have a separate personalized profile. 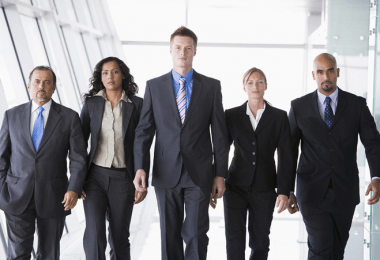 Most firms do not even realize that they are being reviewed by the AdvisoryHQ News staff until after our review and due diligence have been completed and published. We then send the selected firms a heads-up email, informing them that AdvisoryHQ has reviewed and included their firm on our top ranking list. 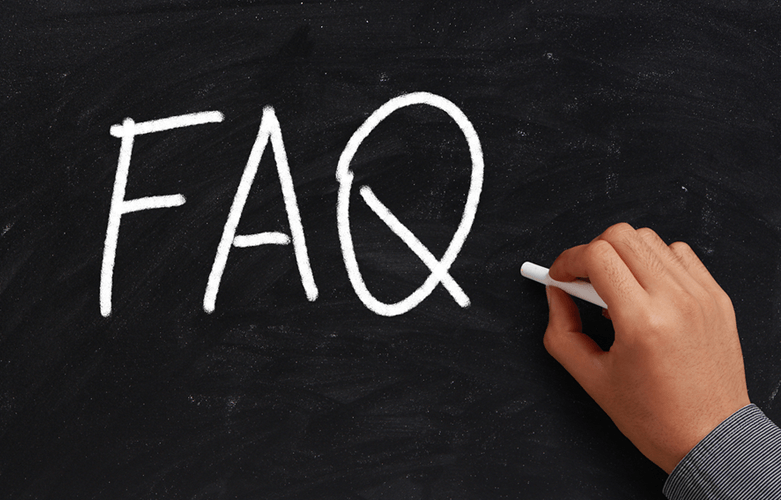 See the FAQ section on a firm’s ability to request corrections to their reviews. No! For questions, please see: Freedom of Press and Media (U.S. Constitution – 1st Amendment – S.1598 – 114th Congress, 1st Session of Congress). You can also view the Freedom of Information Act and the U.S. Privacy Act (U.S. Code › Title 5 › Part I › Chapter 5 › Subchapter II › § 552a 5 U.S. Code § 552a – Records maintained on individuals, agencies and firms). However, please let us know if you have any requests for corrections to be made to your firm’s review or ranking, and we’ll be more than happy to make the necessary changes after performing an objective assessment of the requested changes. Click here for information on requesting corrections or changes. For SEC disclosures, please click here: SEC Award Criteria Disclosure. Being featured on AdvisoryHQ provides your firm with exposure to a viewership that includes millions of highly active consumer readers who are sometimes at the decision-making stage. Are you looking to target your advertisement to a specific article, category, or audience? Then a high-impact Scroll Reveal Ad Unit is exactly what you need. 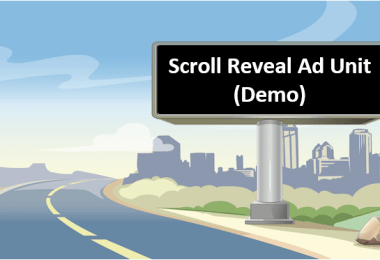 A Scroll Reveal Ad Unit ensures 90%-100% visibility to your firm’s advertisement and provides you with the highest level of user engagement compared to all other ad types. Click here for a quick demo. Click below to request a quote on a scroll reveal Ad unit. 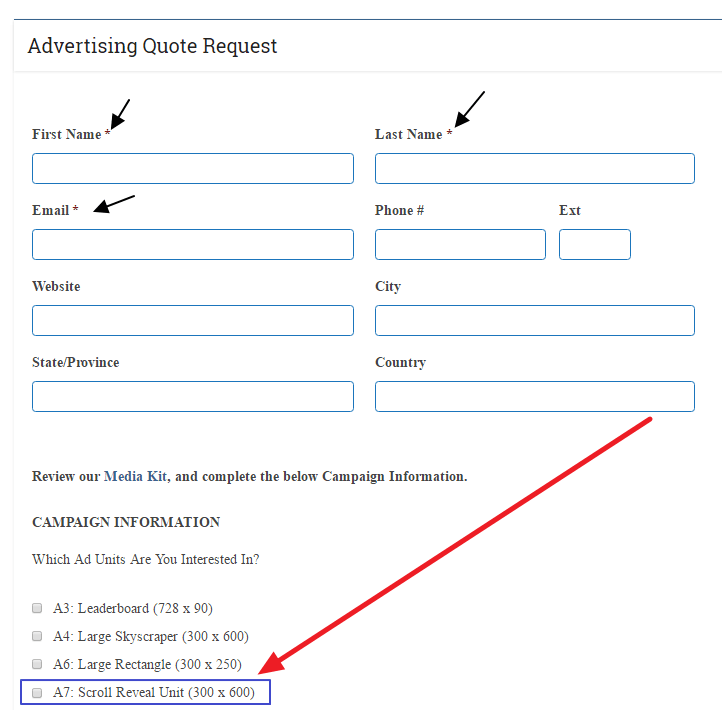 On our “Request a Quote” form page, you’ll see the below form. Just enter some basic information, and select the “Scroll Reveal Unit (300 x 600)” box. Click here for a detailed review of AdvisoryHQ’s methodologies.